Ask The Bellwether: What can you weave with 2 heddles on the rigid heddle loom? What can you weave with 2 heddles on the rigid heddle loom? I gave an overview of reading weaving drafts in my last rigid heddle post, to help you identify 2-harness (or if you prefer, 2-shaft) table/floor loom drafts and figure out how to thread them on your rigid heddle loom with just one heddle. When you add a second heddle, the possibilities multiply. For starters, you can use a yarn that is twice as fine -- warping both heddles as described by Ashford here and by Schacht here lets you use both together. So, if you have 8, 10, and 12-dent reeds, besides being able to use yarns that are 16, 20, and 24 wraps per inch (plain weave sett/ends per inch is typically 1/2 the wraps per inch of the yarn; thicker will be more tough, in both senses of the word, and thinner will be more gauzey -- the technical term is sleazy, as the threads on too loose a sett will slide over one another), you can now use yarns that are 32, 40, and 48 wraps per inch -- that would make a wonderfully thin, drapey stole or fine silk scarf. Aaahh. But it turns out, there are a whole host of interesting 3-harness (3-shaft) patterns out there, with names and everything. I was flipping through the May/June 1989 Handwoven (thanks to blogless Kathy, a local weaver extraordinaire), and lo-and-behold, an article about 3-harness weaving! Of course, given it was woven at a very loose sett and fulled, and I used a multi-color handspun 2-ply, that diamond design is a bit lost. But, it's there, and if I looked closely I could see it. You can see that it uses just three harnesses, and has a straight tie-up. So, when I threaded the heddles, I threaded the front slot (to match harness 1), the front hole(to match harness 2), and the back hole (to match harness 3). Anything threaded in the front heddle goes through slots in the back heddle, so they are only raised and lowered by the front heddle. Also, anything threaded in the back heddle's holes must go through a slot in the front heddle. See the Ashford and Schacht writeups mentioned above for good pictures of threading the front heddle's threads through the back heddle's slots. For the treadling, first I had to lift harness 1; since it was the slot thread, I "lifted" it by lowering both heddles to the down position. Second, lift harness 2, which is the front heddle. And third, lift harness 3, the back heddle. So, it was both down; front heddle up/back heddle neutral; front heddle neutral/back heddle up; repeat until woven. point twill: turn the twill around, so you go 1-2-3-2-1-2-3-2-... repeating across, and treadle the same way (1-2-3-2-1-2-3-2-...). 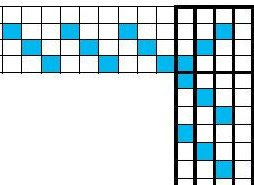 Leigh has a nice post on 4-harness twills showing how they turn into point, rosepath, and broken (herringbone) patterns. rosepath, which is an extended point twill that looks like a path of roses; this is pretty as a stripe in an otherwise plain-weave tea towel. summer & winter -- Ashford's 2-heddle writeup shows how to do this, along with its cousin, Taquete. Bronson lace -- this lace is interesting because it uses the first harness on a multi-harness loom at the "tie-down"; so you can have lace with just 3 harnesses. Other related laces (huck and Swedish lace) move the tie-down around with the lace pattern. Here's a Margaret Atwater article, The Bronson Weave Four Ways, talking about having 3 spot positions with 4 harnesses -- with our two heddles, we have "3 harnesses" so can have 2 spot positions. Spot Bronson, cousin of Bronson lace -- this has a nice texture, I've made some washcloths with it. Krokbragd -- a weft-faced weave from Norway, traditionally woven with three colors. warp floats and their cousins, deflected warp -- if you put your warp floats on the back heddle's holes, then you can control when they float and when they don't. By weighting them separately from the rest of the warp, you can also deflect them for even more visual interest in your weaving. In the picture above, you can see I have the front heddle up and the back heddle in neutral; so I have harness 2 up, and harnesses 1 (the slot-only warp threads) and 3 (the back heddle holes' threads) down. So, have at it -- look through Margaret Davison's tome A Handweaver's Pattern Book , Anne Dixon's colorful The Handweaver's Pattern Directory , and pick out the simple 3-harness twills, rosepaths, and more from Margaret Windeknecht's Color-and-Weave and Color-and-weave II -- or whatever weaving books are on your bookshelf or at your local library. There are 760 3 harness drafts on Handweaving.net -- page down to "Keyword search", leave the keyword box empty, and enter "3" in the minimum shafts and maximum shafts boxes, then click "search". That should be plenty to keep you busy for a while (grin). A topic to mention when you map a 3 harness pattern to the rigid heddle loom is, what to do about the rigidity of your heddles. On a harness loom, the heddles move, so you can thread 3 in a row on harness 3 without leaving a big gap; but on your rigid heddle loom, you'd be skipping a lot of slots and holes if you spaced them out. So consider grouping two warp threads in the same slot or hole to keep your ends per inch where they need to be if the pattern you are mapping repeats the same harness next to itself. Pay attention to the ends per inch, rather than blindly grouping all repeats in the same path -- some spreading may be called for. Consider this draft, for example. With its 1-1-1-1-2-3-2-repeat threading, I'd be likely to start by grouping the 1's in pairs, skipping the intermediate rigid heddle slots/holes for 2 and 3, then do 2, 3, skip the open 1, 2 again, and repeat. If it gave me the ends per inch I wanted, I'd keep going that way. A sample would definitely be called for, to see if it would turn out the way I wanted it to look. If spacing of the warp is a concern in the final weaving, sample first, and remember to wet finish your sample -- the yarns may move into the position you want, or they may track badly -- it's better to learn from a small skein of sample yarn than to have to throw the completed project in the Goodwill box because it didn't turn out like you had hoped. So if you would want to do this with a pick stick you could. I have been muddling this around my brain and I think I might have come up with a solution. I think, you would first run your pickup stick through it's relative tie- up and THEN run your holes and slots with the remaining warp? Hopefully, we'll see how it turns out and I'll post some pics on weavolution of the end result. There really isn't a way for me to get a second heddle unless I buy another loom which isn't gauranteed because I got mine from ebay. Thanks for your help. I'm still trying to understand all this draft and tieup business but I think I'll get it one of these days. Thanks so much, that's finally something that makes sense to me! I'm weaving tabby with the double heddle kit on my Ashford KL but struggling with how to adapt other drafts. So helpful, thank you! I have a two harness peacock loom. Would this work with putting the #3 warp threads in no heddle? Still a little confused on the details. I know my two harness can do more than I think. You can use a 2-harness table loom like the peacock. The only thing to watch for is that the shed-- the space between the two layers-- is cut in half so you need a fairly thin shuttle or not much yarn on your stick shuttle, so it will move easily throu the shed. 80 ends per inch is very dense; most rigid heddle looms' finest reed is 12 ends per inch, so weaving closer than 24 ends per inch would not be feasible. However, backstrap weaving, with hand-made heddles, would be possible at that fine a level. 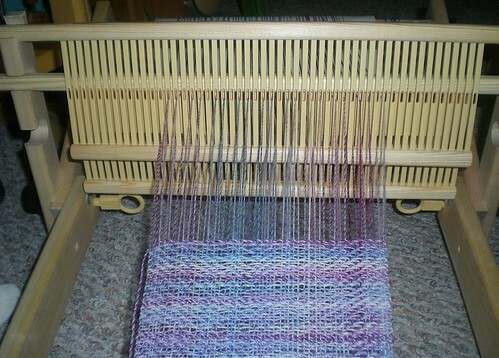 Typically people start with thicker weaving, and advance to the finer levels once they have mastered the basic techniques. 5 years late, but came across this excellent post. and slots) to the harness, and work that the same as a rigid heddle loom with 2 heddles? I make my own rigid heddles for backstrap, and I am thinking this method (2 rigid heddles) would work on my Peacock. Copyright © 2001-2016 Amelia Garripoli and AskTheBellwether.com. All Rights Reserved. Unauthorized use and/or duplication of this material without express and written permission from this blog’s author and/or owner is strictly prohibited. Copyright © Ask The Bellwether 2001-2016. All Rights Reserved. Simple theme. Powered by Blogger.